When Google wanted to solve its Android Wear problem of voice and services in China, it turned to the homegrown company Mobvoi. With Google blocked and Alexa not yet supporting Chinese, Amazon now has a chance to do the same for the Echo or it could sit this game out and let the DingDong take all those smart home hub sales. The lost-in-translation, rhyming LingLong DingDong A3 - or Buzz A3 - is a 698 yuan ($118) Echo rival that has just been announced by voice recognition company iFlytek (previously referred to as a Siri rival) and the big deal Chinese retailer JD.com. So, yes, an Amazon-style site. Read this: We're living in the age of voice input so why do I feel silly? The voice controlled gadget shares much of the same features too: playing music and audiobooks, checking news, weather and the internet, controlling smart home gadgets, dealing with your calendar and giving you directions. Right now, there's 10 third party services that work with its voice controls. The A3 comes in Mandarin and Cantonese versions - you can't get both at once - and works with three command phrases. It also understands basic English but this isn't the primary concern what with Juniper suggesting China's smart home market could be worth $22.8 billion by 2018. What's more interesting is that LingLong execs are actively floating the idea of collaborating with Amazon in China. So most likely is that Amazon could sell the Echo with the localised Chinese voice recognition tech and services if it doesn't go for Mobvoi as Google did. Also there's the chance the DingDong/ Buzz could join the club of Alexa-powered smart home devices. Available in white, black, red and purple, the DingDong A3 isn't an identical cylinder to the Echo - it's circular at the top and square at the bottom. 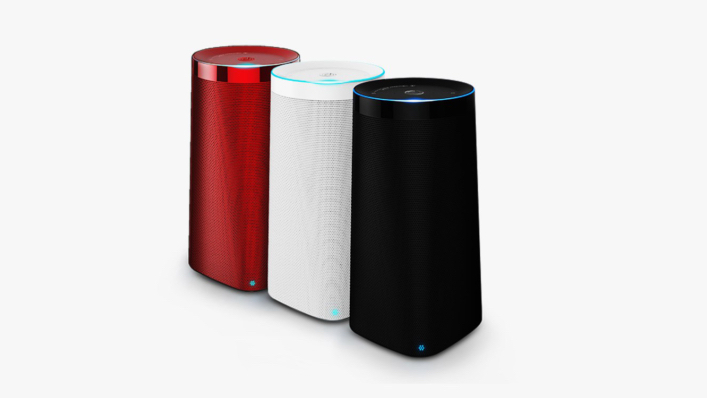 There's also a bigger, metal DingDong A1 for 798 yuan and a Q1 range of colourful, voice controlled Bluetooth speakers.